A fresh mix of banter and blood, Jim Hansen’s You’re Killing Me disembowels the Internet age with a smirk. Spawned from the minds of Hansen and co-writer and star Jeffery Self, You’re Killing Me fosters a unique charm in its ability to evoke winces and chortles. However, comedy seems to be put far ahead of horror, as even the most gruesome scenes are framed hysterically. Still, there’s enough satirical insight often paired with a few notable moments of uneasiness to keep You’re Killing Me’s cadaver rattling long after decapitation. Joe (Matthew McKelligon) is a soft-spoken, handsome millennial looking to come out of his shell. Dating is rather unsuccessful for Joe, until a friend encourages him to pursue “anything he wants.” Unfortunately for those around him, what he wants happens to involve brutally murdering most of the people he meets. 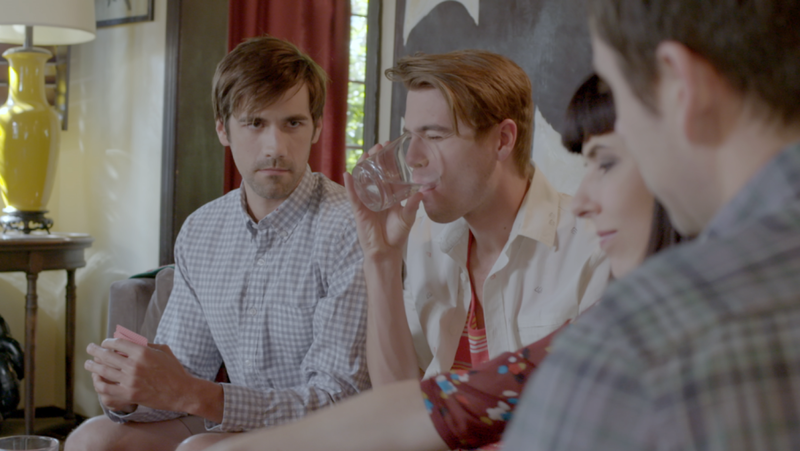 One hopeful catches his eye, however: George (Jeffery Self), a narcissistic, struggling Internet performer desperate to find the key to going viral. After Joe meets George in the middle of the night by the latter’s car, the two grow close following a conversation about frozen beef and broccoli. As the duo’s bond grows, Joe begins to systematically murder everyone that remotely annoys his new lover, unbeknownst to the self-engrossed George. Though mostly light-hearted, the film kicks off with a strong commentary on the nature of social media consumption. Joe becomes enamored with George, essentially building up his ideas about the individual through the raunchy and clever videos he posts online. To the contrary, George is caught off guard by their initial interaction; not due to being eerily approached while unloading his groceries, but rather because Joe lacks a Facebook account. This, in turn, creates an interesting dynamic, as one party is conveyed mostly by their digital presence, whereas the other can only emit his honest, real-life self. Which, of course, happens to be a violent sociopath whose obvious cues fall on belligerently deaf ears. George is expertly portrayed by Jeffery Self, as his self-indulgence grows more apparent when his significant other’s actions become more severe. Likes and retweets emerge as the only currency that matters, as at one point he echoes remorse for a character that failed to congratulate him and his partner, Barnes (Bryan Safi), after Adam Lambert shared one of their works. George is compelled by the quiet Joe, who, in his eyes, represents the perfect audience. This, in turn, explains George’s colossal failure in recognizing what transpires in his immediate vicinity, instead opting to engulf himself in electronic gratification. The film maintains a light-hearted approach, distancing homicide and brutality in a few key instances. Almost every occasion that finds Joe stabbing or hacking is literally illuminated from a divine light, often on cue with a moment of penetration. One can be just as put off as they are proud, as Joe is finally finding a means to feel good about himself. A testament to Matthew McKelligon’s abilities, Joe is very difficult to dislike, even at his most heinous. You’re Killing Me isn’t very scary. Of course, that’s far beside the point. You’re Killing Me is a charming spin on a sub-genre typically plagued with morose figures and ghastly events that seem a bit too gaudy to be taken seriously. Given, that’s not to say You’re Killing Me doesn’t have its share of gaudiness. It’s just more aware of it. Why You Should Watch Madhouse if You Haven’t Already!